1. 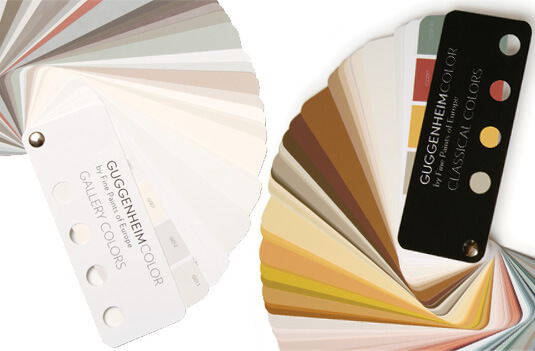 First up, The Guggenheim Collection from Fine Paints of Europe was introduced in 2011. This collection has two palettes. “Classical Colors” are color-colors derived from works of art at the Guggenheim. The “Gallery Collection” is full of neutrals, including whites and off-whites, taken from colors put onto the walls to display art: “50 hues favored by generations of Guggenheim Museum curators, artists, and designers—including Frank Lloyd Wright himself.” The Gallery collection, in particular, sounds pretty cool. Lots of people want to display art… artfully. So why not take the lead from professionals who must agonize and OCD over shades and hues and saturation like we can’t even imagine. 2. The Sherwin-Williams Suburban Modern Collection — with two palettes, one for interiors, the other, for exteriors — is a longtime favorite here at Retro Renovation. If you’re looking for classic 1950s pastels like aquamarine and flamingo pink and even pearl gray — go here, these are great colors. This Sherwin-Williams palette also had a wonderful avocado, harvest gold, beige and pinky beige. This company gets major props from me for being first on the midcentury bandwagon. 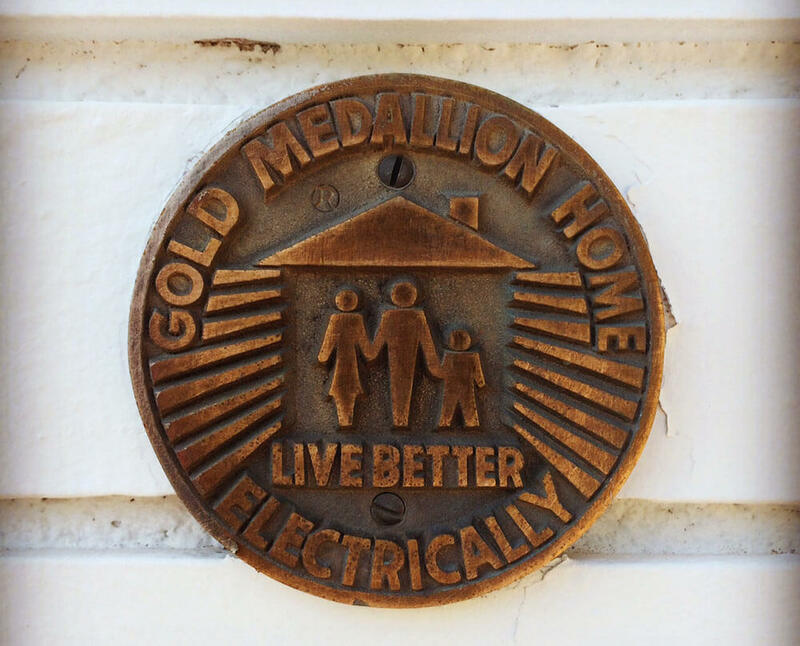 Goodness, they were a lifesaver for me when I started my house 10 years ago. 3. 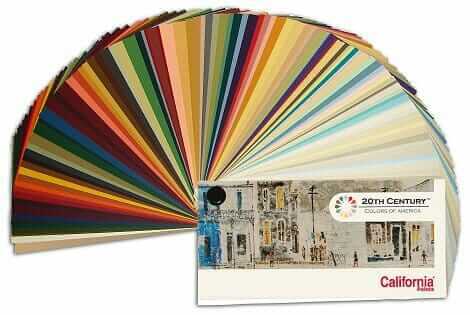 California Paints in 2010 introduced a huge collection of 20th Century Colors of America, researched in partnership with the nonprofit Historic New England. 4. Pittsburgh Paints has the Fallingwater Collection — paints inspired by Frank Lloyd Wright, authenticated by the Western Pennsylvania Conservancy. 5. Frank Lloyd Wright’s 1955 paint palette for Taliesen, specified in Martin Senour paints, is shown in this artifact. If you can blow up the image enough to read the chips… then triangulate to Martin Senour formulas today, you’d have another authentic Frank Lloyd Wright paint palette. 6. Eichler colors — The Eichler Network has matched historic Eichler colors with Benjamin Moore Formulas. Go to pages 6 and 7 in this article to see the chips. 7. 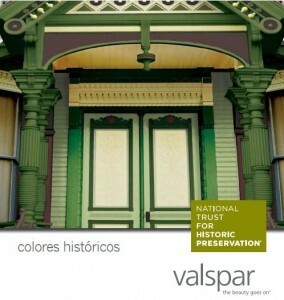 The National Trust for Historic Preservation has partnered with Valspar to offer a pretty big historic paint palette. 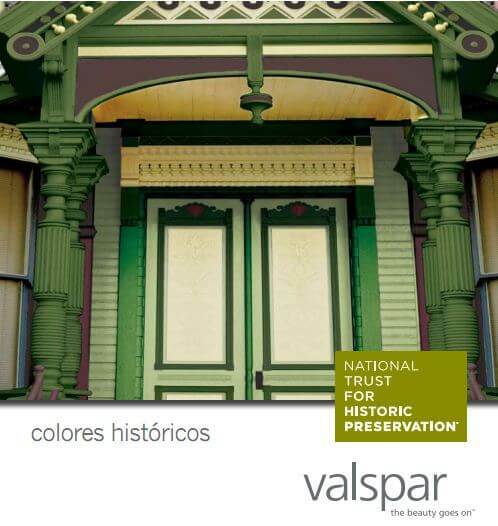 “There are over 250 historic colors, documented from historic sites and places across the country, in the Valspar palette.” Price on this paint is going to be pretty competitive, I think, as this is a very accessible brand found at Lowes. I also think I have read that Valspar paint does well on a certain magazine’s annual quality tests. 8. 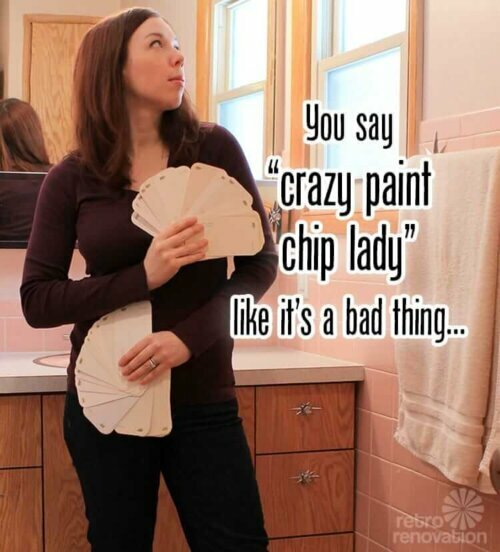 Benjamin Moore’s historic paint palette has legions of fans. 9. Rodda Paint has an historic paint color collection. 10. 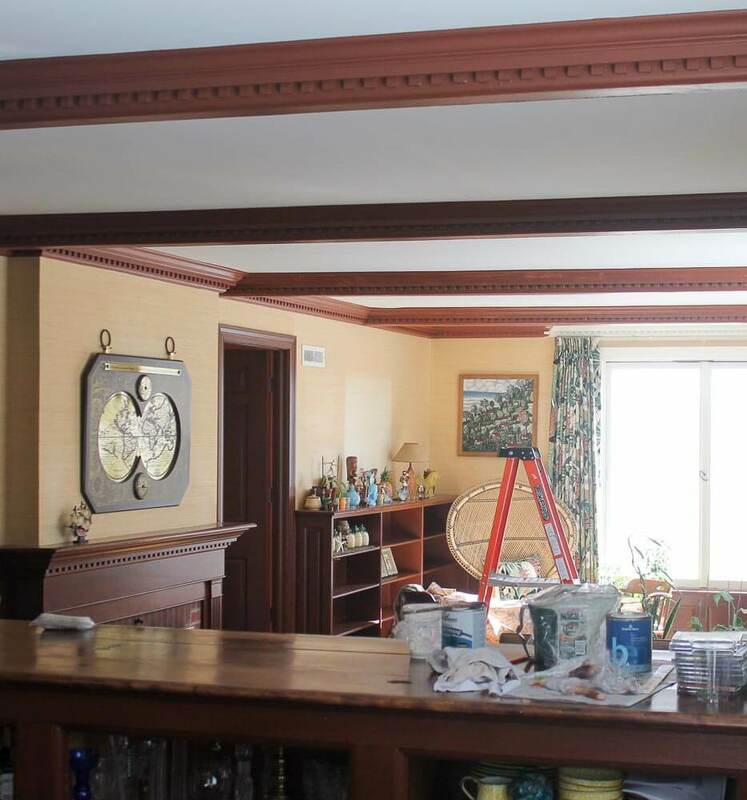 Union Village has two very focused palettes of classic Early American paint colors. You can buy small cans if you are painting furniture. 11. Finnaren & Haley has an Historic Colors of America collection. Created in collaboration with the Society for the Preservation of New England Antiquities — which is now known as Historic New England, this collection of both interior and exterior paint colors from early America history. It seems to be the predecessor to the California Paints collection with Historic New England. 12. Finnaren & Haley also has Authentic Colors of Historic Philadelphia. There are 31 colors in this line, all uncovered from historic buildings and many authenticated by the National Park Service. 13. Pratt & Lambert offers an Historic Williamsburg Palette. 14. Duron Paint does Historic Charleston. 15. Historic colors of Spanish St. Augustine — St. Augustine is the oldest city in America, and the preservation community there has matched original Spanish St. Augustine paint colors to Benjamin Moore and Sherwin-Williams paint colors. So cool! Hey, aren’t you impressed how deep I dug for this story? 16. 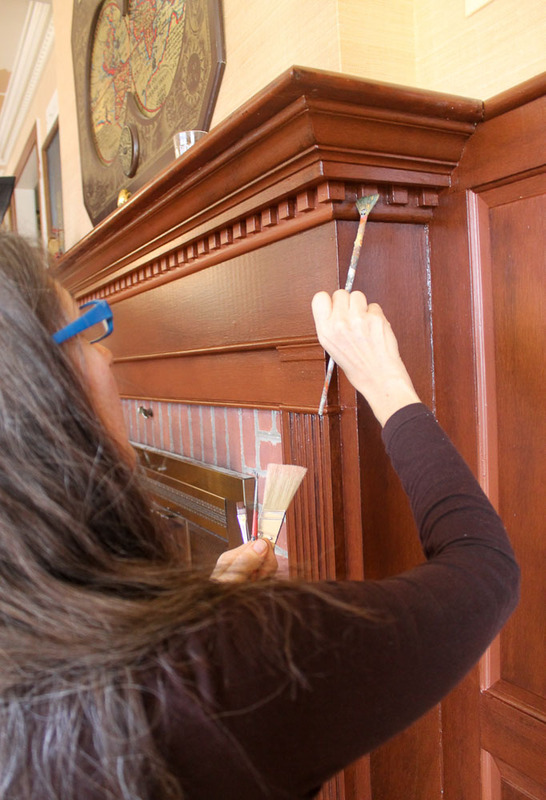 Fine Paints of Europe covers historic paint colors for Mount Vernon. 17. Fine Paints of Europe also gives us historic paint colors of Nantucket. 19. Little Greene also has an English Heritage paint collection. Wow, that’s some list isn’t it? I am quite proud of myself. please email me for permission first. This research and story are copyright Retro Renovation 2012. Soon as I saw this I burst out laughing, thinking, “So it’s not just me!” Many thanks for this great comic photo and the many links. I’d print out the photo and put it up on my bulletin board, but would it go with the wall color…….hmmm…….